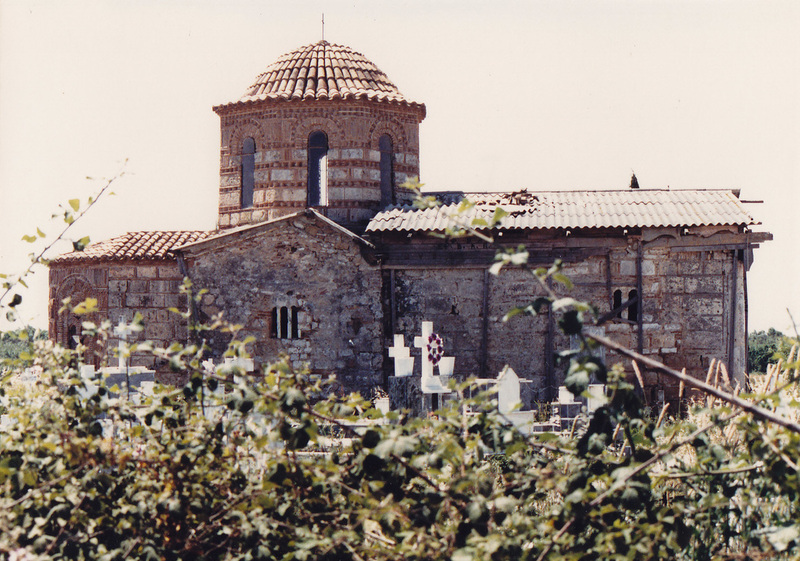 One of a number of interesting Balkan anniversaries this year is the Battle of Manolada. It was fought on July 5, 1316 at Manolada, on the plains of Elis in the Peloponnese region of Greece. The Angevins of the Kingdom of Naples had inherited the Principality of Achaea upon the death of William II Villehardouin in 1278 and transferred their rights to Louis of Burgundy in 1313. Ferdinand of Majoroca who claimed the title by marriage contested this. In June 1315, Ferdinand landed near the port city of Glarentza, and proceeded to conquer the plain of Elis, including Andravida, the capital of the Principality. Louis' wife, Matilda of Hainaut, then arrived ahead of her husband who was seeking Venetian support and secured the support of a number of local lords. Ferdinand successfully engaged Margaret’s forces at the Battle of Picotin in February 1316. Louis finally arrived in the Principality just after the battle with a Venetian fleet and he moved to Patras, where Byzantine forces sent by the governor of Mistra reinforced his troops. Ferdinand was also expecting reinforcements from the notorious Catalans in the Duchy of Athens and from Majorca, but rather than retreat and join up with his allies, he decided to give battle. We know little about the armies other than it appears Ferdinand was heavily outnumbered, making it even stranger to justify not withdrawing. Ferdinand’s confidence may have been down to the quality of his troops. Feudal cavalry of Achaea was reckoned by contemporaries to be the very best and together with his Spanish knights he had a force of 500 cavalry. Lighter armoured Greek cavalry together with Slav and Greek infantry spearmen, javelinmen and archers would supplement them. He also had a force of Spanish foot. 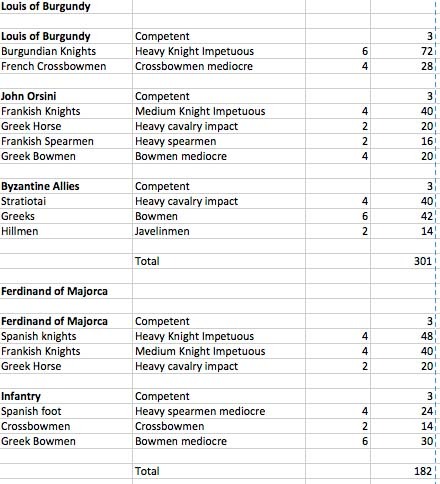 He had more infantry, possibly as many as 1000 foot. There was also a small force of military order knights, including the Teutonic knights, but it is not known if they fought at Manolada and if so for what side. Ferdinand formed his troops in a forest, but was forced into the open when Louis’s troops burned the trees. The Majorcan troops then charged with around 500 cavalry that broke the first Burgundian line; commanded by John Orsini, count of Cephalonia. The second line, commanded by Louis, defeated the Majorcan charge, and Ferdinand was dismounted and inadvertently slain before he could be taken prisoner. “He was the most accomplished knight, and the bravest of any King’s son in the world, and the most upright and wisest in all of his acts”. His ‘wisdom’ in attacking an army three times larger must be questionable at least! 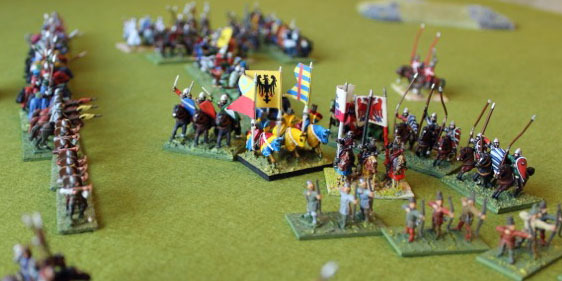 The loss of their commander resulted in the collapse of the Majorcan army, and they fled towards Glarentza. The Catalans on hearing of the defeat returned to Athens. Louis didn’t enjoy the fruits of his victory. He was dead by October, probably poisoned by Orsini. There were a number of planned campaigns by his successors, but the Byzantines gradually recovered most of the Morea, before succumbing to the Ottomans. 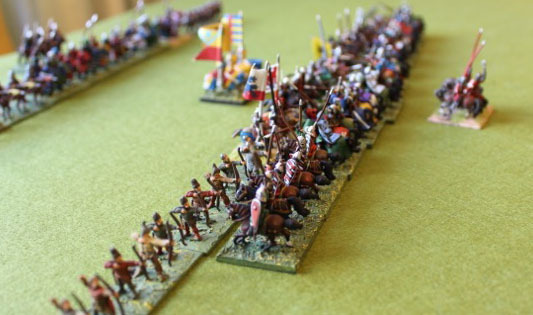 Spanish troops have left the woods on the right while the Burgundians and their Achaean allies form into two lines. 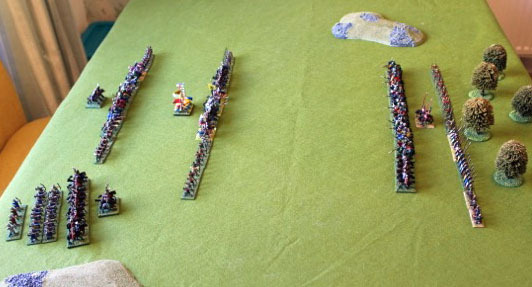 Ferdinand's army with the cavalry in front and infantry forming second line. Louis counterattacks and Ferdinand is killed. Battle over.